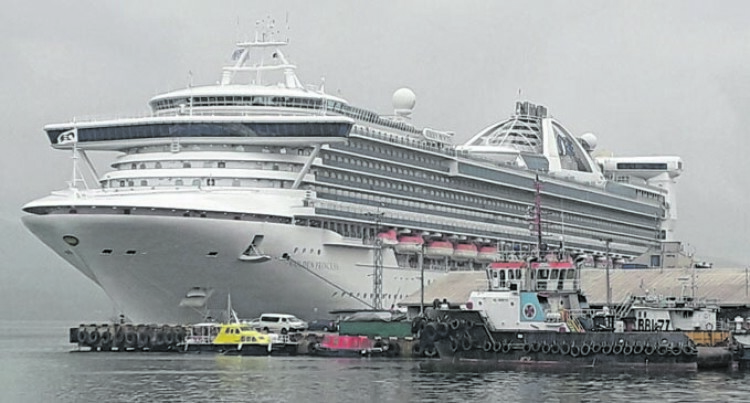 Cruise ship Golden Princess is the third cruise liner to have visited the country this year. This was confirmed by Kenua Fiji Manager Leone Naivalu on Monday. The $450m cruise ship carried in a total of 2670 tourists and 1064 crew members when it called into Suva Port yesterday morning. Suva Port was the United Kingdom based vessel’s second port of call for the two days it is spending in the Fiji waters. The vessel berthed at Port Denarau on Monday, was in Suva yesterday before it departed for Port Vila, Vanuatu last night. Vessel agent Kenua Fiji, Manager, Leone Naivalu confirmed that the cruise liner was the third cruise vessel listed under Kenua Fiji’s watch to berth into the country this month. “This is Kenua Fiji’s third cruise liner for the year, as we had welcomed Carnival Legend and Sun Princess in our waters on January this year,” Mr Naivalu said. According to the cruise liner’s schedule by Kenua Fiji, the cruise liner Golden Princess is expected to make another round to Fiji in November this year. Golden Princess is a Grand-class cruise ship with Princess Cruises that entered service in 2001. She is the sister ship of Grand Princess and Star Princess. The vessel measures 109,000 gross tonnes and had primarily operated in Hawaii, and the West Coast of the United States. Golden Princess was constructed in Italy by Fincantieri. It features three formal dining rooms and two high-end specialty restaurants, Crown Grill and Sabatini’s. A mini golf course (9 holes), several pools, a spa, a gym, a video arcade, a children’s facility, a dedicated teen centre, a screening room (for recent movie releases), Movies Under the Stars screen, multiple bars and lounges and three modern show lounges. The ship’s main theatre located at the forward of the ship seats approximately 1,000. The ship has four swimming pools, nine spa’s and an adults-only area, the Sanctuary.